Join us as we illuminate the spirits of the wild and wooly cowboys and Indians that once inhabited the vast prairie. 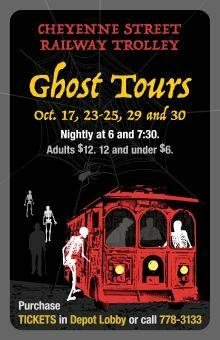 Expect numerous bumps in the night as the Trolley travels through the haunted highways and paranormal passages of Cheyenne. Explore the darker side of Cheyenne as you hear chilling tales of our local haunts. The tour route is different each year with all new surprises, so you can come back for more...if you dare. We recount people's ghostly experiences as relayed to us. The tour is based upon actual spine tingling events as people perceived them. We work closely with paranormal investigation groups to provide relevant paranormal data. The investigators participate in the tours. Costumes are encouraged!